What's the hidden meaning and history behind the traditional ritual of Japanese tea ceremony? For the Japanese, tea is a way of life. In addition to consuming it as an everyday beverage, the Japanese have long celebrated tea drinking with an elaborate ritual known as the tea ceremony, or chanoyu. Are you ready to discover the the hidden meanings of the ceremony? The first documented evidence that we have of tea in Japan comes from the 9th century AD. However, the ground green tea (matcha) that is such an integral part of the tea ceremony today did not arrive until the 12th century, when a Japanese monk named Myoan Eisai brought some back from China. The tea ceremony began to take on its present form during the 15th century, when tea master Murata Juko developed the spare, simple aesthetic associated with traditional tea ceremonies. Sen no Rikyu, another famous tea master, further refined the ceremony in the 16th century. There are two main types of tea ceremony. The difference between the two lies in the formality and length of the occasion. A chakai tea ceremony is somewhat more casual, although there is still a strict pattern and proper etiquette to follow. If there is a meal, it is usually light, although nothing more than sweets may be served. The more formal chaji ceremony comes with a much more elaborate four course meal called a kaiseki and can last as long as four hours. Chagama: The cast-iron kettle used to heat water for tea. The use of tetsubin is more closely associated with the drinking of loose-leaf tea (such as Sencha), rather than the formal tea ceremony. For the purpose of boiling water, most Chanoyu experts prefer to use the chagama or ortegama - an iron kettle with neither a spout nor a handle! 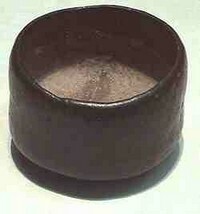 Chawan: A tea bowl for use in the ceremony. They are short but wide - just the right shape for whisking matcha powder and water into a delicious beverage. Chasen: The bamboo whisk used to mix the tea. Chaire: A tea caddy (a small container with a lid) used for storing koicha matcha, made of ceramics. Usachaki: A tea caddy used for storing usucha matcha, usually made of lacquer. Kaishi: A special paper used to eat the traditional sweets that are served as part of the ceremony. While other necessary implements are provided by the host, each guest is required to bring their own kaishi! 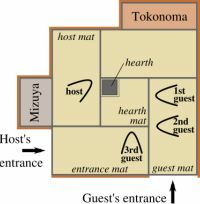 The actual steps of the tea ceremony can vary depending on who is hosting, who is attending, the season of the year and more. However, all ceremonies start well before the guests arrive, with intense preparation on the part of the host. The host must select a theme for the ceremony, decorate the tea room or tea house accordingly, select flowers and arrange for a meal and/or sweets. Each and every detail of the tea ceremony must be carefully planned to express the ceremony's theme. When the guests arrive, they will wait outside until the preparations are completed. 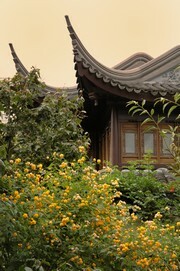 Usually, teahouses are equipped with gardens for the guests to relax in beforehand. The garden usually has a roji, a green, dewy area with a washbasin where the guests can freshen up, symbolically purifying themselves to prepare for the ceremony. Once the tearoom is ready, the guests enter, with the main guest or guest of honor in the lead behind the host. 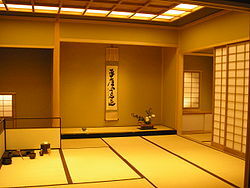 The tea room is always decorated very simply, with a small alcove called a tokonoma. The tokonoma holds a scroll embellished with calligraphy by a Buddhist master. The meaning of the scroll should reflect the theme chosen for the ceremony. After the guests admire the tokonoma, everyone is seated and exchanges greetings. If the tea ceremony is to be the full-length chaji type, the guests will be served the multi-course kaiseki meal along with some sake. This meal consists of at least four courses worth of carefully chosen, seasonal items. If the tea ceremony is the more casual chakai ceremony, guests may be served a light meal or simply sweets. After the sweets, it is tea time. All of the guests focus exclusively on the host as he prepares the tea. Preparing tea for chanoyu is much more than simply whisking matcha powder into a tea bowl. It is almost like a dance, a series of carefully choreographed tasks and motions. Everything from making the fire to scooping the tea to mixing it all up has to be done a certain way. Once the tea is ready, the host will serve the main guest first. Koicha, the thicker, sweeter and more expensive grade of matcha, is served in a single bowl that all guests will share. Usucha, which is thinner, is served in individual tea bowls. At some tea ceremonies, both types of tea are served. In these cases, koicha is served first and usucha is served after. After the tea has been consumed and the utensils have been cleaned, the guests will take a moment to observe and compliment them. Utensils and teaware are often quite valuable and may be heirlooms or antiques. Then, the guests and the host exchange good byes, and the tea ceremony is over. Why did the everyday act of drinking tea evolve into such an elaborate ceremony? The tea ceremony was developed to express Zen ideals such as harmony and appreciation for the moment. Even though each tea ceremony follows traditional rules of etiquette and procedure, each tea ceremony is different, too: a moment in time that must be appreciated because it will never be experienced again. During the tea ceremony, both hosts and guests aim to express the ideals of harmony, purity, respect and tranquility. In many cases, the tea room and the tea utensils are designed to express a simple, unadorned, rustic aesthetic known as wabi, introduced by tea master Sen no Rikyu. For an in-depth but enjoyable review of chanoyu, I highly recommend that you read this masterpiece by Kakuzo Okakuro. Written in 1906, this is a tea classic that you will love. Unlike many of the tea classics, which are either written by a Westerner for the Western audience, this is an English book written by a native Japanese artist.